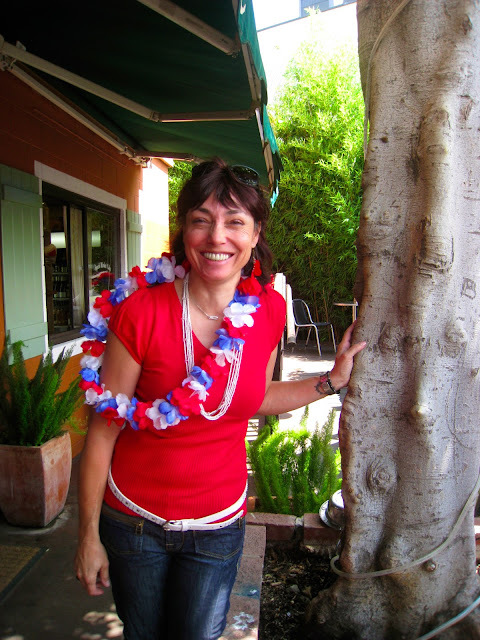 Blogtown: The French Market Celebrates 20 Years and Bastille Day! The French Market Celebrates 20 Years and Bastille Day! I am so grateful for The French Market Cafe. It is my little spot to go and feel real community, real neighbors, and real good coffee every day in Venice. They are celebrating 20 years of business this year, not an easy feat, especially these days. So it was a party for Bastille Day yesterday ... a perfectly glorious day outside, made more so by the festive atmosphere of the Musette music and special bbq menu (Merguez sausage! Croque Monsieur!) for the occasion. The outdoor patio was festooned with red, white and blue for the French holiday, and the loyal patrons were in the mood to party in the daytime. Always fun. Owner Agnes Martinez was radiant in her patriotic outfit, and our gracious hostess accepted kisses and congratulations for all of her hard work over the years making "The French" a place that is absolutely beloved by her locals. Thank you to Agnes, Carole, Eddie, Jenny and everyone who makes The French Market Cafe a joy to share your day with! Here's to many, many more years of French food and fun ... J'adore!!! I sharer your enthusiasm for the "French", CJ!! I love our trips there when I am in Venice!! I love that it is still one of the unique local businesses in Venice!! Congratulations to Agnes and her Crew for the great 20-year Anniversary!! Long live the FRENCH"!! I agree with your enthusiasm, CJ!! I love going there with you every time I am in Venice!! I love that it is still one of the unique LOCAL one-of-a-kind businesses that made Venice the gret place it was (and hopefully will continue to be if people rise up and stop the greedy corporate groups that are trying to ruin it!! Congratulations to Agnes and her Crew on your 20th Anniversary!! May god bless you with many more, and may the people of Venice continue to smell your delicious coffee (etc.) and protest the destruction that has been going on to other businesses and dwellings!! Long Live the FRENCH MARKET! !